We carry out same day repairs or same day replacement of parts such as fans, diverter valves, PCB’s, thermostats, thermistors, air pressure switches, heat exchangers and pretty much every part you can think of. We use a number of suppliers and 95% of the time we can get you up and running the same day. Boiler swaps and central heating installations can take from 1-5 days depending on the complexity of the job. 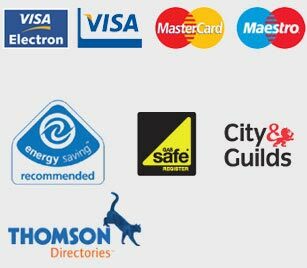 All of our plumbers are Gas Safe and City & Guilds accredited – our plumbers have been trained to the highest of standards to ensure the work they carry out is completely safe and compliant with all relevant regulations. You can rest assured that you’re working with a trustworthy, reliable team of experienced plumbers when you hire us! Yes we are fully insured for all work we carry out. We have no call out fees, even in an emergency, however on occasions when a problem requires a diagnosis we may charge a small fee for the plumber’s time. Upon completion of any works Homecure will provide you with a full written, no quibble guarantee. We offer a minimum 12 month guarantee on all new installations including boiler and central heating installations with a minimum 3 month written guarantee on all repair work. In certain cases guarantees can be upgraded to 2 years, depending on the type of installation and we can also offer some fantastic extended manufacturer guarantees on certain boilers which can be up to 10 years. All materials and products purchased by us are covered by full manufacturer’s warranties and our labour is backed by our own guarantee of workmanship which is second to none. Any defects arising from faulty installation or repair work that may require rectification, and that occurs within the guarantee period, are treated as a priority and dealt with at the customer’s earliest possible convenience. Our London plumbers are all local and can be with you in an hour. If it is not possible for us to reach you on time, due to unexpected traffic or an accident then we will let you know. Yes, we do a lot of work for Landlords and agents where we collect keys, although it’s better if someone is on site in case we need to ask questions or get authorisation for works quicker. If you would like a reminder call then please let our team know in advance. How much experience do your plumbers have? All Homecure plumbers are fully qualified with at least 5 years’ experience. All our engineers specialise in reactive maintenance (breakdowns / emergency plumbing) so are excellent problem solvers who have come across almost every known issue possible. Wherever possible and in most cases our engineer will give you a fixed price to complete the job in hand. This is once he/she has fully diagnosed the problem. This way you have peace of mind of knowing the exact cost of the job, no hidden or unexpected fees will be added. Yes, you can book us up to 4 weeks in advance. But please be aware that changes, amendments or cancellations must be made more than 48 hours in advance. Any changes or cancellations later than this may incur a fee. Work must be paid for on completion by credit or debit card and we reserve the right to take a deposit for any required parts and materials that may be needed.